We are a chicken kind-of-family all.the.way. Maybe it’s because chicken is one of the cheapest meats, or maybe it’s because we just genuinely like it. We eat it about 60% of the time – the other 40% of the time we eat beans and eggs and small amounts of pork, beef, and fish. We eat chicken drumsticks at least once a week, and I try to make a whole chicken every two weeks. I’ve seen other bloggers share how they make 4-5 meals from one chicken, and I really didn’t think it was possible. 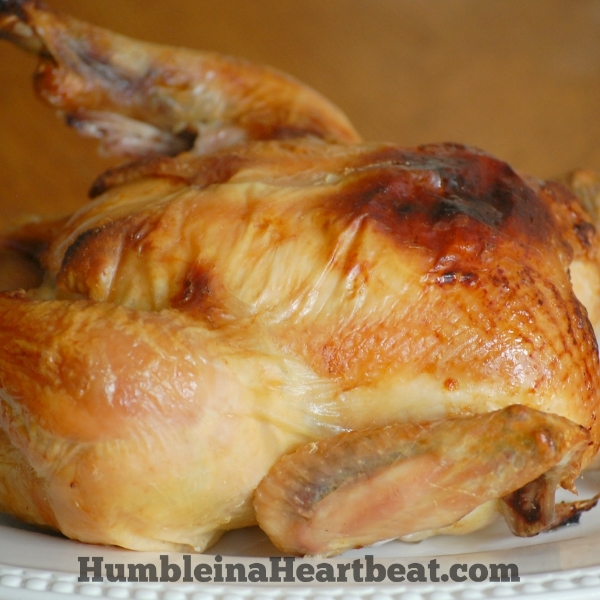 Whenever we make a whole chicken or buy a rotisserie chicken, it seems like we eat it in a snap. 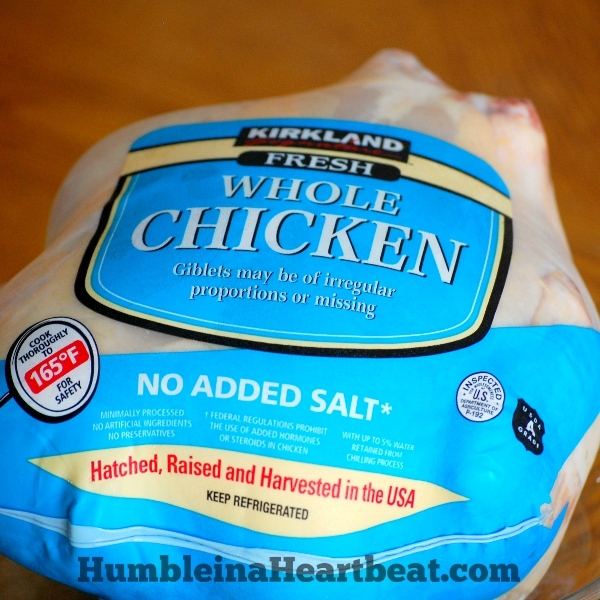 So I set out to find the truth: Can you really get 4 or 5 meals from one whole chicken? Guess what? It’s true! You really can get 4 or 5 meals from one whole chicken. 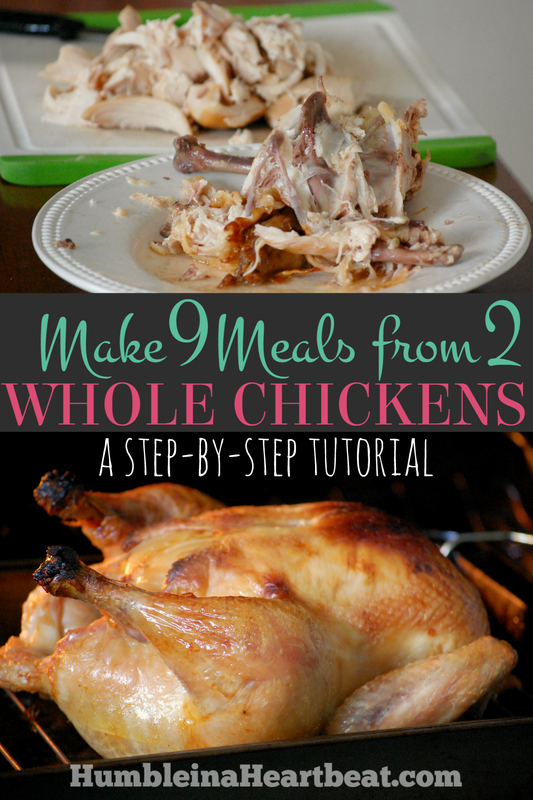 I’d like to share with you below how we get 9 meals from 2 whole chickens! When you can get more out of your meat, you can significantly lower your grocery budget. When I buy a whole chicken from the store, it is around 5-6 pounds. You might come across 3 or 4 pound chickens where you shop, so just be aware that you probably won’t get as many meals from a small chicken. You can use this tutorial for a family of up to four people. Any more than that, and you’ll probably get fewer meals out of your chicken. If you’re only cooking for two, you can probably get one or two more meals out of each chicken. Some of the suggested recipes in this tutorial might not be what you want to eat. I am giving you examples of how we get the most use out of our chicken. You will probably want to come up with your own ideas when you try it. Ok, so I thought I’d offer a nice step-by-step tutorial to help you get the most out of your whole chickens. Since starting this experiment, I have frequently bought two chickens together from Costco once or twice a month. The chickens cost $0.99 per pound and they each weigh a little more than 5 pounds. So we end up paying less than $11 for two chickens. $11?! For 9 meals?! That’s just $1.22 per meal! Step 1: Brine the first chicken. As soon as you get home with your two chickens, get a brine ready for the first chicken. Brine it overnight. Here is my simple brine recipe. Step 2: Prepare the second chicken by cutting it into 8 pieces. Get the second chicken ready once the first one is in the fridge. Cut it into 8 pieces. Never done that before? Watch this simple tutorial. Step 3: Use the 8 pieces to make at least 4 meals. Put the carcass into your slow cooker. You can also throw in the giblets if you’d like. Put the lid on and turn it on high. Let it cook for 4 hours. 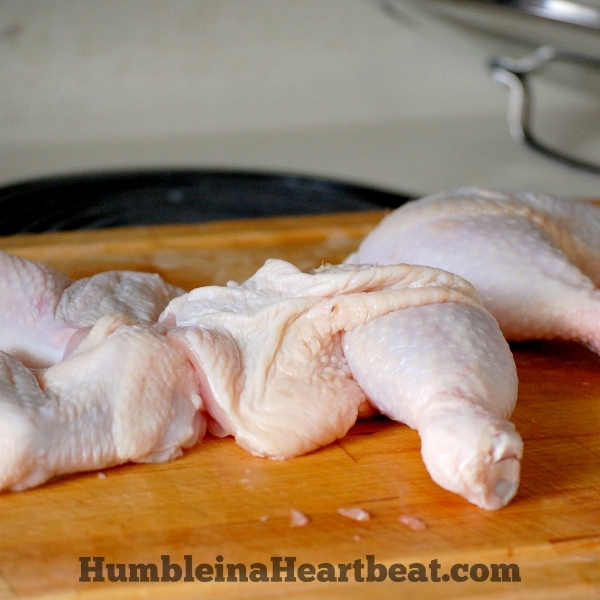 Meal 1: You can make dinner on this first night with the wings and drumsticks (and thighs if you wish). 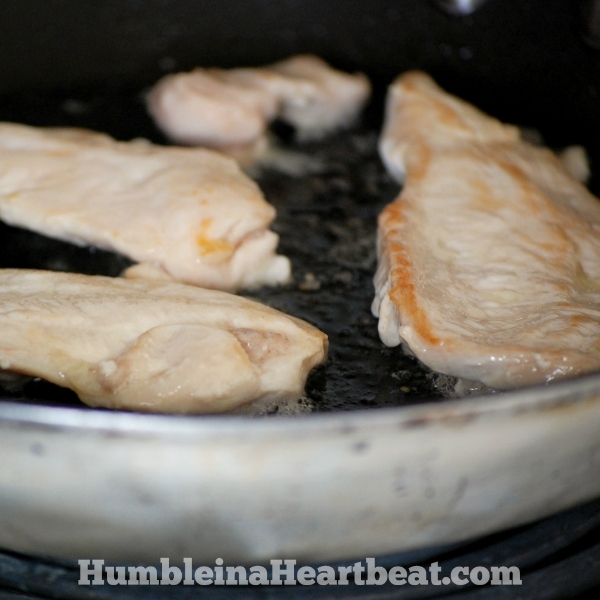 Meal 2: Use the chicken breast for a meal the next day or you can slice the breasts thin, cook them, and use them for sandwiches for the next 2 or 3 days. Meal 3: Once the chicken and carcass in the slow cooker is done, take all the meat off the bone and put the carcass back in the slow cooker. Add more bones (you’ll have some from dinner), vegetables, water, and some salt to make stock. 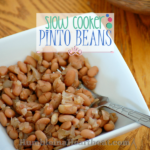 Cover the slow cooker with a lid and turn on low for 10 hours. 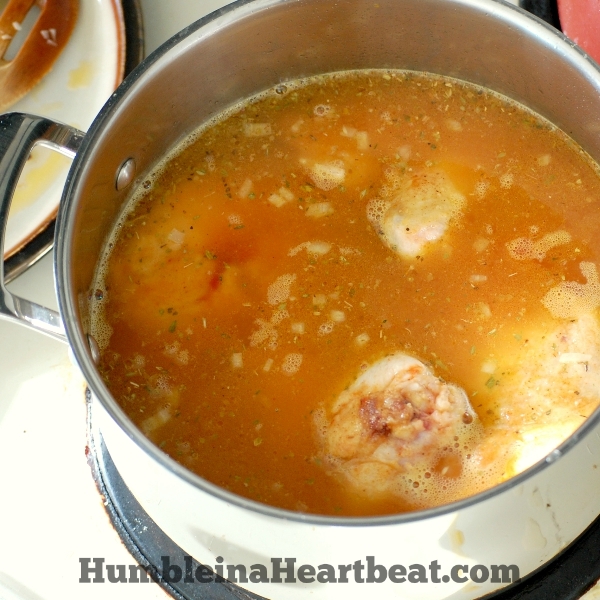 In case you want more direction with your chicken stock, here’s a tutorial that can help. The chicken stock will then be used for soup in the next few days or you can put it in the freezer for later use. Meal 4: With the meat you took off the carcass, use it for a meal in the next couple days. 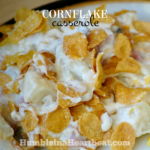 It’s not a whole lot, but if you eat it with plenty of veggies, it can be enough. Also, if you did not use the thighs for dinner on the first night, you can use them for another meal later. Step 4: Roast the first chicken and get 5 meals out of it. The next day, after the first chicken has been in the brine for a good 12-20 hours, get it ready to roast. 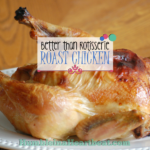 Roast it according to the weight of your chicken and the directions in my post for Better Than Rotisserie Roast Chicken. Meal 5: Eat the roasted chicken with several side dishes as your meal for the night, but be sure that there is plenty of meat left to use for other meals. 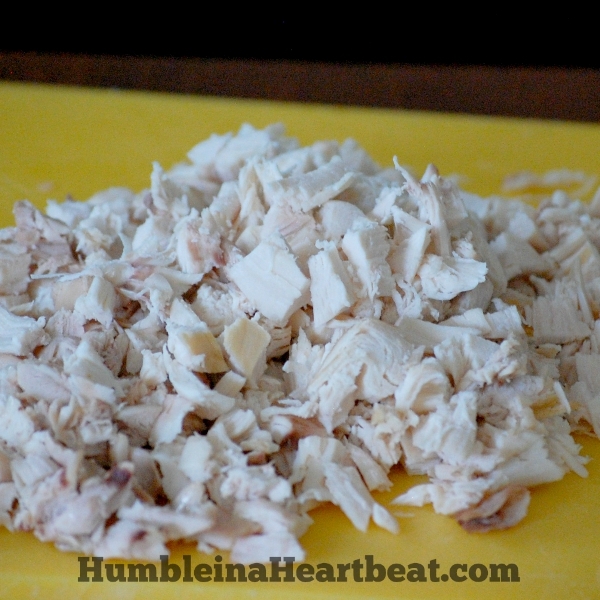 Meals 6-8: After you eat, shred and/or cube the rest of the chicken that you can take off the carcass. I always get between 3 1/2 to 4 1/2 cups and that can translate into 3+ more meals. 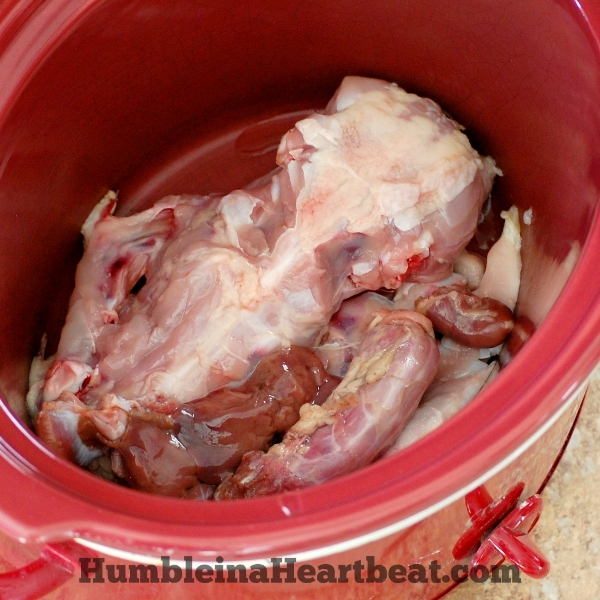 Meal 9: Use the carcass and bones from dinner to make more chicken stock. Use the chicken stock to make soup. Step 5: Put any leftovers in the freezer. Be sure to freeze any stock, bones, or meat that you did not use within 2-3 days. These are meals that we have made using our whole chickens. Remember that your family may like something else, so these are just ideas. There are so many more possibilities for these chickens! Come up with some meals of your own and try making 9 meals from 2 chickens in your home. When you make a plan for your chicken before you eat it, you can do a lot with it. I hope this tutorial helps you out and that you can find plenty of uses for all your chicken. What do you like to make with chicken? Please go ahead and give my page a like on Facebook or follow me on Pinterest! If you want to stay connected each week, sign up for my weekly newsletter. Such a simple meal, yet everyone loves it! I bet your family just devoured that chicken, Nina! It is mostly just the 2 of us now, so it would go a long way. Thanks for the reminders…trying to cut corners any way I can. I made chicken tonight, 2 breasts, I cooked it in water with onion, garlic, celery seeds, poultry seasoning. Then I took out the meat, shredded it, and I have enough for at least 5 meals for the 2 of us, even with large portions. You made my hubby’s night, he loved the chicken tacos. 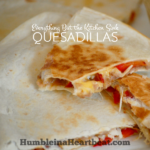 Later this week it will be Quesadillas. I am going to freeze the chicken stock. I was stuck in a rut, and you pulled us out. Thanks SO MUCH! Wonderful, Deanna! It’s great to hear that you could get so many meals from just two breasts. A frugal meal I like to make with the meat from a whole chicken is chicken gravy. I make a simple gravy from butter, flour, and the stock I made from the chicken. I add sautéed mushroom and onions and whatever shredded chicken I have. A cup is plenty if you shred it up well. 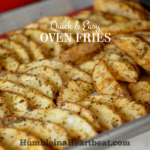 Serve it over mashed potatoes, baked potatoes, rice, noodles or homemade bread. 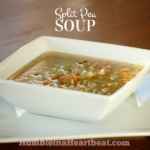 It’s super frugal, delicious, and adaptable.